The following is more of a public service announcement than a repair. I have owned the same Naomi 2 motherboard for about 5 years now. I use it on and off in my personal collection and have never had an issue with it. A few weeks ago, I tried to boot the system, and unfortunately it was stuck on a black screen, completely unresponsive. I could see the power LED’s turning on, the fans would spin up, but it would never make it to the boot sequence. I was especially frustrated as it was working a few weeks prior before going back in storage. I did some reading online, this is apparently a very common issue on both Naomi 1 and Naomi 2. 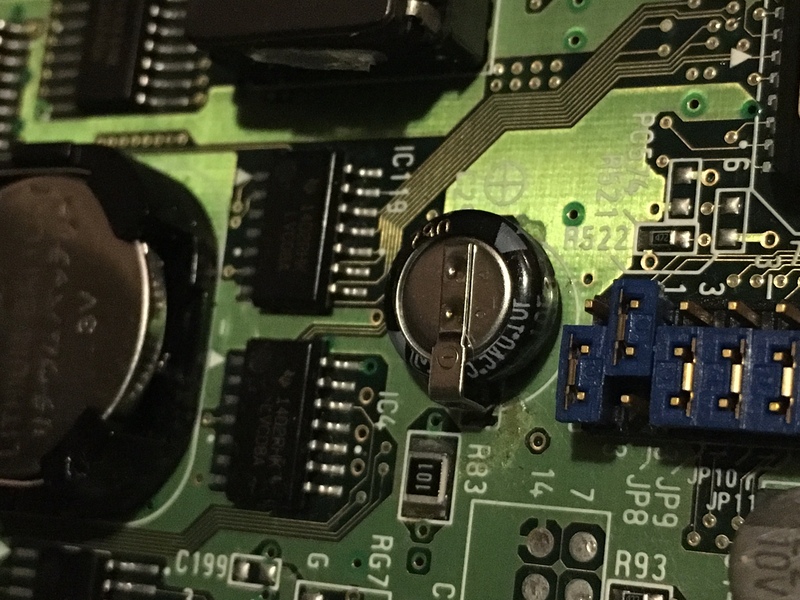 There is a 5.5v 0.1uf super capacitor near the bios. This capacitor is known to leak, and when it does, the 5v levels become unstable causing the Naomi to not boot. The fix was relatively straight forward, install a new super cap. I was able to find a Panasonic OEM replacement for about $5 including shipping. It was actually really difficult to remove the old cap, the ground and 5v traces quickly absorb the heat from the soldering iron. I ended up cutting the capacitor off of the board and removing the legs with tweezers. Once removed, I used wick and a lot of patience to clear the holes. It was slow moving but eventually became clear, be sure to use the largest solder iron tip you have. Once the holes were clear, I used white vinegar on a q-tip to clean the surrounding area on the parts side of the PCB. The cap had indeed leaked, and rusted on the bottom. Fortunately I caught it in time, before the electrolyte destroyed any traces. Installing the new capacitor fixed my Naomi 2. It has been running reliably since installing the new cap. If you own a Naomi, and the super cap has not been serviced, I would strongly recommend checking it before its too late!